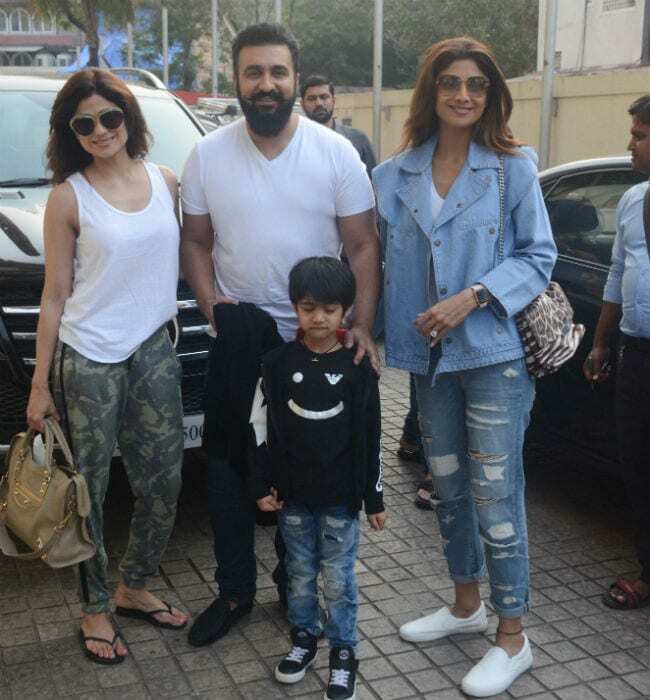 Actress Shilpa Shetty, her husband Raj Kundra and their son Viaan were spotted at a movie theatre in Mumbai's Juhu. Shilpa, 42, was seen in a white dress and accentuated her look with a pair of yellow stilettos. She escorted Viaan towards the car and smiled for the cameras. The family of three were accompanied by Shilpa's mother Sunanda Shetty. A couple of weekends ago, Shilpa, Raj, Viaan and Shamita, the actress' sister, were photographed at the same movie theatre. Twinkle Khanna and daughter Nitara and Hrithik Roshan, Sussanne Khan and their sons were also there (but were spotted separately). 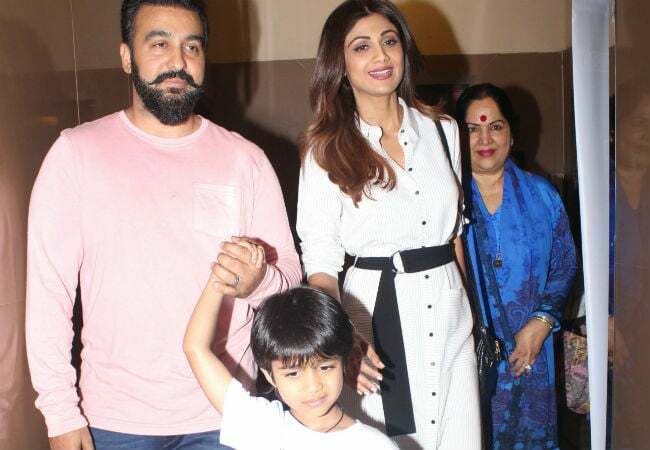 See these pictures of Shilpa, Raj Kundra and Viaan at the theatre. Shilpa's book Diary Of A Domestic Diva was launched recently and she won the HT Most stylish Author Award. In case you missed it, here's Shilpa's picture from some weekends ago. Shilpa and family ringed in the New Year in Dubai and opted for a home-stay there. Their pool-side picture became crazy viral in just no time. "Holidays are all about chilling by the heated pool," Shilpa captioned a post. Shilpa Shetty and Raj Kundra have been married for over eight years now. Viaan, 5, is the couple's only child. They celebrated their anniversary in November and Shilpa wished Raj with an adorable picture from their wedding album. "I loved you then, I love you still.. I love you now and always will. Happy Anniversary @rajkundra9, my family maker, superman, sunshine, soulmate, best friend and anchor. 8 years down, forever to go," she wrote. Shilpa Shetty is the star of films such as Baazigar, Dhadkan, Life In A... Metro and Apne. She is also a yoga expert and also released a range of yoga fitness videos. In 2014, Shilpa produced her first film Dishkiyaoon. She has co-judged dance reality shows like Jhalak Dikhhla Jaa and Super Dancer, which is currently in its second season.